Steven Richards, right, of the Army National Grard, reacts to his newly rebuilt 1981 Yamaha SX650 during a family surprise event at Ohio Cycleworx in Lima. To the far left is his wife, Kelsey. Steven Richards, right, of the Army National Grard, starts his newly rebuilt 1981 Yamaha SX650 during a family surprise event at Ohio Cycleworx in Lima. Steven Richards, right, of the Army National Grard, with his wife, Kelsey, and daughter, Scarlett, 15 months. ELIDA — Christmas came early for Ohio National Guard serviceman Steven Richards, 23, of Elida, when he received a gift that brought a big smile to his face Thursday afternoon. 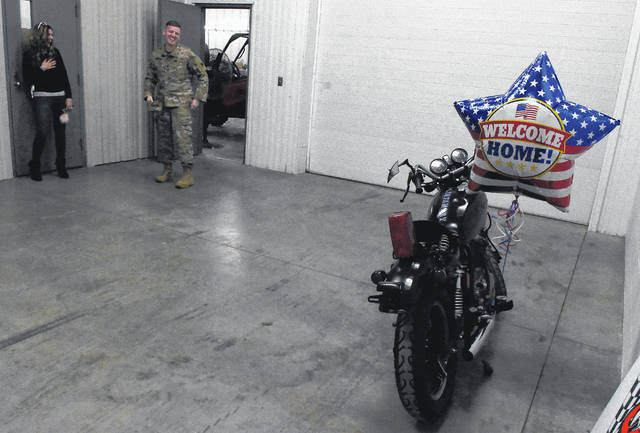 His family and friends chipped in to refurbish the motorcycle he had been working on before leaving on a tour to Jordan. Richard purchased the 1981 Yamaha 400 motorcycle for $300 from a friend who had bought it from a friend. The motorcycle did not run. 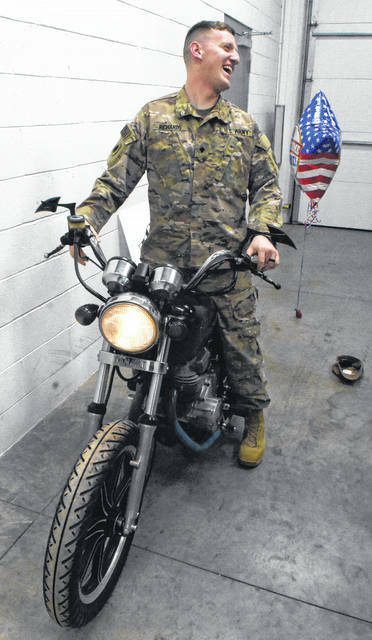 Shortly after buying the motorcycle, Richards’ unit, the Ohio National Guard Unit 148 was called up. He left for Jordan and was gone 11 months. 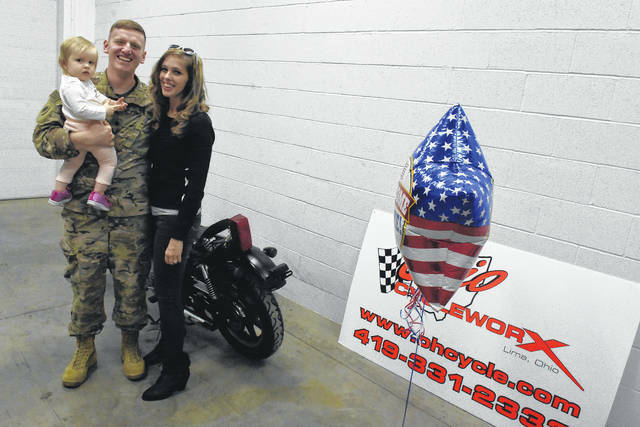 Richards’ wife, Kelsey, and her cousin, Jeff Coolidge, made arrangements with Ohio Cycleworx to refurbish the motorcycle. “It’s his baby,” said Kelsey. Jamie Ealy, service manager, at Ohio Cycleworx worked on the motorcycle. “When the bike came in, it didn’t really run and it had a couple of electrical issues that he was fighting. We brought it in here, checked it all out, cleaned the carburetors on it, got those tuned into the motor, got it to where it would run right. Had to change the oil in it and get that all serviced up. Checked the battery and replaced the battery and repaired the wiring for the turn signals, so we could get this thing back up to legal status and make it run and operate for him so he could drive it,” said Ealy. Ealy said he gives 10 percent off of everything to military personnel. Richards arrived in Toledo Wednesday night and made the drive back to Elida with his wife, Kelsey, and 14-month-old daughter, Scarlett. Kelsey told Richards the garage door was broken and he couldn’t enter the house that way. She did not want him to see that his motorcycle was gone. Richards was brought to Ohio Cycleworx on the ruse of picking up a part for someone else’s motorcycle. He was surprised walking through the door and seeing his motorcycle. What surprised him even more was finding out it was a 650 instead of a 400, as he had originally thought. “Everything I found on it, it is a 650,” said Ealy. Richards hopped on the bike and was urged to start it. “I forget how to start it,” said Richards. Ealy, once again came to the rescue showing Richards how to start the bike.